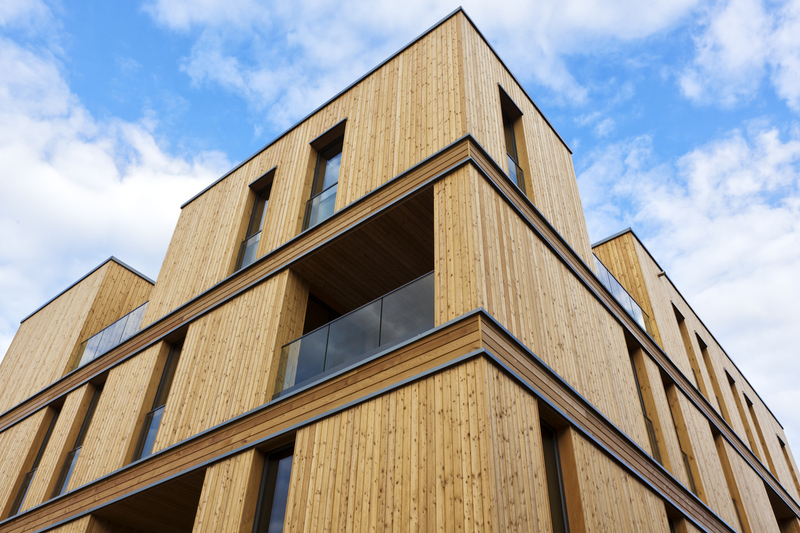 Already a staple in Europe, mass timber products provide an alternative to concrete and steel for both residential and commercial applications. One of the most popular products is cross-laminated timber (CLT) which consists of a number of layers of dimensional lumber stacked in opposing directions and glued together to create structural panels. These panels range in size and are utilized in walls, ceilings and roofs. As the CLT panels are prefabricated, they come replete with openings for doors, windows and stairs. Prefabrication in factory conditions helps to standardize quality and makes for a more precise build. Instead of building entire structures onsite, construction workers only have to assemble the building elements on the building site—making for a faster and more accurate build with less waste. 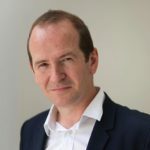 Nail Laminated Timber (NLT) uses the same principles as CLT but instead of the layers of timber joined with adhesives, they are connected with nails or screws to create structural panels. Its strength makes it perfect for use in decking, flooring, walls and roofs and it has even been used for elevator and stair shafts. Glue Laminated timber or Glulam (GLT) is made up of individual dimension timber stacked in parallel layers that are glued together. 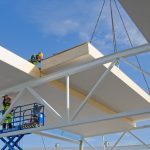 Glulam has stiffness and strength and is utilized for beams and columns. Dowel Laminated Timber (DLT) panels are held together by dowels rather than fasteners or adhesives. DLT panels are perfect for horizontal spans for flooring and roofing thanks to their unidirectional grain structure. Mass Plywood Panels (MPP) consist of plywood layups and engineered veneer as a base material in the same way CLT uses lumber. One of the leading players in this new off-site revolution is Metsä Wood, with their signature laminated veneer lumber product called Kerto® LVL. Produced from 3 mm thick, rotary-peeled softwood veneers that are glued together to form a continuous b​illet, Kerto® LVL is cut to length and sawn into beams, planks or panels according to design specifications. Thanks to its growing popularity, CLT production was valued at $119 million in 2016 and that is expected to grow to $2.07 billion by 2025. 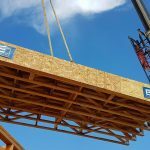 The sustainability of CLT is expected to push wood-based construction over concrete in the future so builders can adhere to green building standards. While the construction labor shortage is fuelling a shift to prefabricated CLT building components, there are still some challenges ahead. Local building codes need to be updated and studies on the seismic and fire performance of mass timber products need to be circulated so that architects, builders and investors understand the true value of CLT as a building material. CLT was approved by the American National Standards Institute in 2012 and included in building codes in 2015. CLT has excellent performance for earthquakes and fire, but many end users still need to be convinced of its efficacy as a building material. Mass-timber products make financial sense, they are sustainable and durable. Their suitability as a building material over concrete and steel mean they have a bright future in North America.